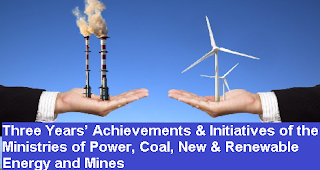 New Delhi: Union Minister of State (IC) for Power, Coal, New & Renewable Energy and Mines, Shri Piyush Goyal, addressed the media on achievements of Ministries under his charge in the last three years, here today. Shri Goyal also interacted with the media present at 7 cities – Ahmedabad, Bengaluru, Bhubaneshwar, Jaipur, Kolkata, Lucknow and Patna - through video conferencing. The principle of “less coal for more power” has yielded results. In 2016-17, 0.63 kgs of coal was used to produce 1 kWh of electricity (specific coal consumption), versus 0.69 kgs in 2013-2014, a reduction of 8%. This ensures cheaper as well as cleaner electricity. Further, coal linkage rationalization of 4 crore tonnes of coal will result in potential savings of about Rs. 3,000 crores.